HTM Hawtai Car User Manual PDF above the page. HTM (HawTai Motor) is a brand of Chinese cars manufactured by Rongcheng HawTai Automobile Co., Ltd., headquartered in Beijing. By the automaker itself, it is positioned as a premium. The production is organized far from the capital. From other Chinese manufacturers the brand differs possibility independently to make diesel engines. Initially, some models were equipped with power units SAIC Motor. Then the company began to produce engines, buying a license from VM Motori, a company that has become a recognized expert in the field of diesel engines. From 2002 to 2010, the company worked closely with Hyundai Motors (Manuals PDF page), had a joint venture with a South Korean automaker and produced passenger cars for it under the Hyundai brand for sale in China. Today, HTM continues to use some of Hyundai's technologies. The HTM brand was founded in 2000 by the entrepreneur Zhang Xijin. Initially, it was conceived as an off-road vehicle manufacturer. 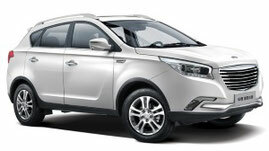 Started in 2002, cooperation with Hyundai allowed her to make crossovers under the famous and authoritative brand. In 2003 the full-scale production of the Terracan model was already launched at the company's plants. After that, Santa Fe crossover clones and Grandbird and County buses were produced. In 2004, the company was given the right to produce these cars under its own name. Between the copies issued under different brands, the difference was only in the installed engines. In 2010, the first sedan appeared in the model line of the brand. It was the first car, independently developed and manufactured by the company. The Hawtai B11 was a fairly large 4.94 meter long sedan, which was equipped with a 1.8-liter gasoline turbo engine developing 161 hp. Also, it could be equipped with a 2.0-liter turbodiesel with a capacity of 150 hp. The power unit was combined with a mechanical or a four-speed automatic transmission. In 2011, HTM tried to buy out the rights to manufacture the new Saab (Manuals PDF page) 9-3, as well as 30% of the shares of the Swedish automaker. For this brand offered to the owner of Saab, the company Spyker Cars, 150 million euros. However, the transaction was never completed. The official reason is the bureaucratic obstacles on the part of the Chinese authorities. Experts also argued that the Chinese company did not want to get involved in patent disputes with GM (PDF Manuals page). In 2013, the production of HTM E70 began, which in the Chinese market is presented under the name Hawtai B21. It is based on the licensed platform Hyundai Sonata. Under the hood is a 2.0-liter Mitsubishi engine with 136 hp. or a 1.5-liter 93-horsepower turbodiesel. In pair to them the five-step mechanical or four-step automatic transmission is offered. In 2014, the company introduced the HTM Boliger model with a 1.8-liter engine developing 160 hp. The engine can be aggregated with a manual or automatic transmission, as well as a front-drive system. In addition, the proposed 150-strong turbodiesel. It is based on the platform of the old version of Santa Fe. The basic equipment of the car includes the ABS system, two airbags, climate control, leather interior, a rear-view camera, a sunroof, an electric adjustment of the driver's seat, a multimedia system with a DVD player. The car was named after the Italian town of Bolgheri. For the Russian market, Boliger is being assembled at the Derways (Manuals page) facility in Cherkessk. In the same year 2014 the first sedan of the brand, developed by the B11, was replaced by an updated version, which entered the market under the name Hawtai E90. It was equipped with a 1.8-liter turbocharged engine of 160 hp, which works in tandem with an automatic transmission. 2014 in the history of the company is marked by another event - the release of a new generation of crossover Hawtai SantaFe, which received a completely different appearance, similar to the South Korean prototype. The car is offered with two engine options: a 1.5-liter petrol turbo engine with a power of 135 hp. and 2.0-liter turbocharged diesel power of 150 hp. Both of them are aggregated with a six-speed manual transmission, and a four-speed automatic gearbox is also offered for the petrol power unit. When creating cars, the brand cooperates with such well-known companies as Bosch, ZF, Intel, Magna, Pier burg, Honeywell. The brand exports its cars to the CIS countries, Southeast Asia, and also to Angola. She is trying to include the European market in the geography of sales.